Fort Calhoun, took two steps backward on Sunday. In the pre-dawn hours, a piece of heavy equipment nicked a temporary rubber berm, 8 feet high and 2,000 feet long, and it deflated. And water there began to approach the switchyard, where grid power enters the complex, so operators started up their diesel generators. A water-filled berm protecting a nuclear power plant in Nebraska from rising floodwaters collapsed Sunday, according to a spokesman, who said the plant remains secure. The 6 to 12 inches of rainfall in the upper Missouri basin in the past few weeks is nearly a normal year’s worth, and runoff from the mountain snowpack is 140% of normal, according to forecasters. 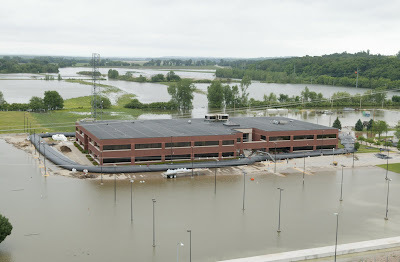 More than 2 feet (60 cm) of water rushed in around containment buildings and electrical transformers at the 478-megawatt facility located 20 miles (30 km) north of Omaha. 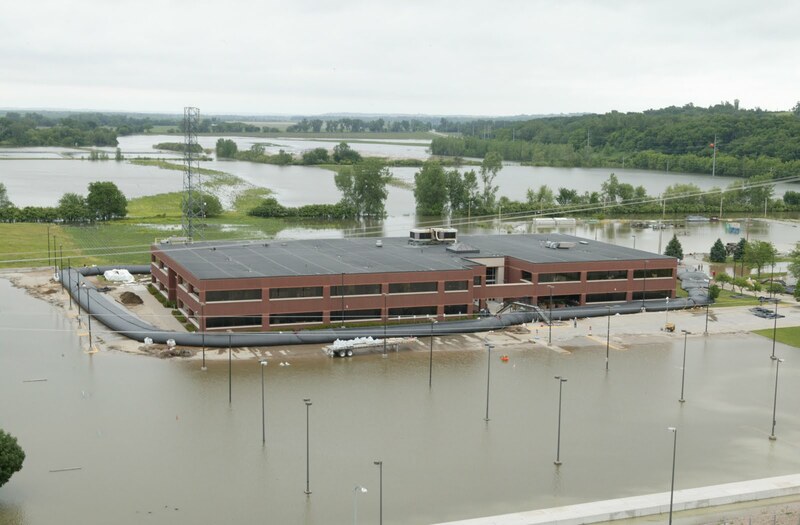 Water surrounded several buildings at the Fort Calhoun Nuclear Station on Sunday after a water-filled floodwall collapsed. 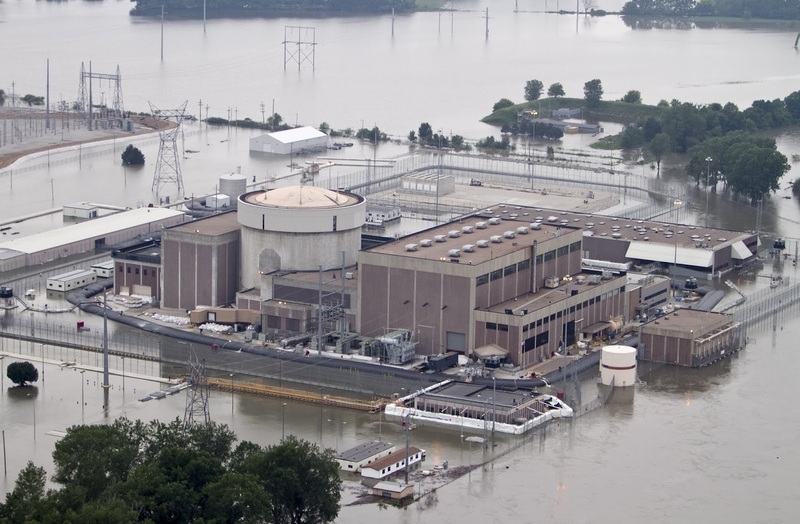 Floodwater surrounded the nuclear plant’s main electrical transformers Sunday after the Aqua Dam, a water-filled tubular levee, collapsed, and power was transferred to emergency diesel generators. The Fort Calhoun plant will remain surrounded at least through August as the U.S. Army Corps of Engineers continues dumping unprecedented amounts of water from upstream dams. 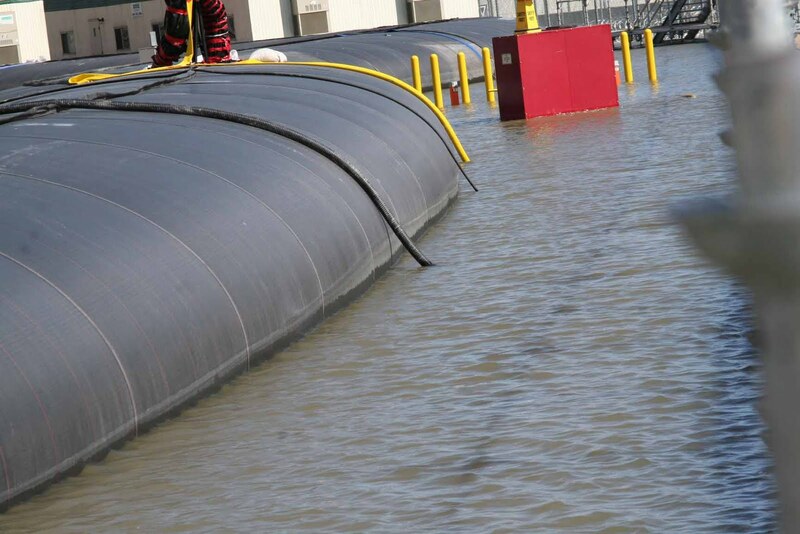 Water now surrounds the auxiliary and containment buildings, which are designed to handle flooding up to 1014 feet above sea level. The NRC said there is a separate, earthen berm to protect the electrical switchyard and a concrete barrier surrounding electrical transformers. Even when in shutdown mode, a nuclear plant requires electricity to keep key components cool in order to avoid any degradation or melting of the core that could result in the release of radiation. Fort Calhoun shut down in April for refueling and stayed closed because of predictions of flooding, so its cooling requirements are much smaller now. It is “designed to remain secure” at a river level of up to 1,014 feet above sea level, and the river level is stable now at 1,006.5 feet ,according to the Omaha Public Power District, the operator. There are also dry cask storage units at the facility, outside of the main building. Here are pictures of the dry casks being delivered to the facility. The area in red shows where one writer (Tom Burnett) believes the dry cask units are located. A Nuclear Regulatory Commission spokesman told The Iowa Independent Friday that dry cask storage of spent nuclear fuel rods at two Nebraska facilities are not being protected from flood waters because the situation poses no public or environmental threat. Following an earlier report published by The Iowa Independent about flooding at the nuclear facilities, questions were raised about the placement of dry cask storage of spent nuclear fuel rods with some questioning if the facilities storing these rods were within flood protection barriers. Spent fuel rods are first cooled in a spent fuel pool for a year before being placed in dry cask storage. The fuel is surrounded by inert gas inside a large container, typically steel cylinders that are either welded or bolted closed. That container is then surrounded by another protective layer — typically steel or concrete — as a further radiation shield. Additional technical information on the process of dry storage can be found in a December 2010 report by the U.S. Nuclear Waste Technical Review Board (PDF). Because of their protected state, Dricks said, there is no danger associated with these storage casks being exposed to the ongoing flood. Indeed, it does appear that most dry cask storage units are vacuum-sealed. So if safety procedures were followed, the spent fuel rods stored in dry casks at Fort Calhoun and Cooper nuclear reactors have a fairly good chance of riding out the flood. Minot is best known as home to an Air Force base, which oversees 150 Minuteman III missiles in underground launch silos scattered over 8,500 square miles in northwest North Dakota.Col. S.L. Davis, commander of the 91st Missile Wing, said there was some “localized flooding” at a handful of missiles sites because of the wet spring and summer. 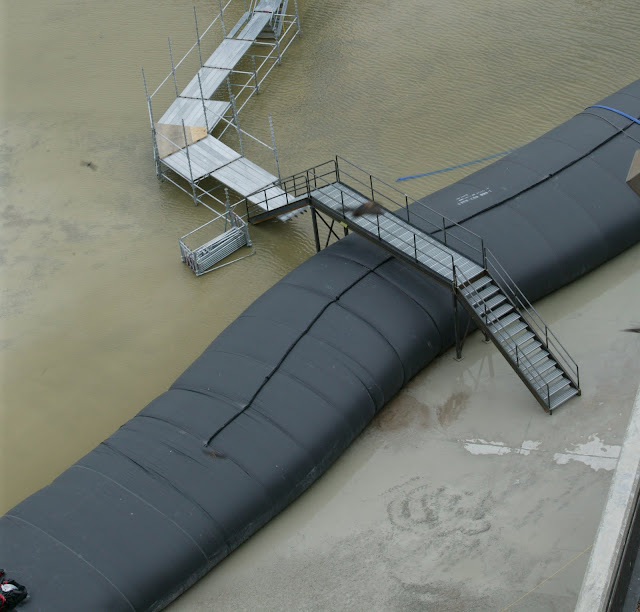 But he said the silos are designed to safely handle some water and protective measures were taken at a few sites similar to what’s done in preparation for spring runoff from snowmelt. I don’t think that nuclear missiles – unlike nuclear reactors – need to be cooled or need a constant electrical supply in order to avoid disaster. So while this sounds scary, I assume the risks are actually low.